Pole Dancing Gloves - Helpful Or Not? Pole gloves are becoming a popular item as more and more people take up the sport. Unfortunately, sweaty hands and blisters are a part of life on the pole for anyone who's even halfway serious about a regular practice. But are gloves the answer? There's definitely a marketing push behind the whole pole dancing trend, and as with any trend that gains traction, there's money to be made in selling related products. Your Pole Pal's goal has always been to make sure you have all the information you need to make choices that are right for you, and this section on pole dancing gloves is no exception. Actually, Your Pole Pal's humble opinion is that the best pole dancing gloves aren't actually gloves. They're more like a gauntlet or an arm warmer, since they don't cover your palm or your fingers (a safety hazard). These "gloves" are actually meant to protect your forearms from pole burn, which is a common soft spot, especially for beginners. You might also experience pole burn on your forearms from a long workout session involving aerial moves, perhaps when you're working hard to master a new spin and you're repeating the move over and over. While your hands will tend to get blistered in the short term, and eventually develop calluses for protection, the delicate skin on your forearms will literally feel the burn. It will take a LOT for it to toughen up, so these fishnet arm warmers are just perfect for protecting that baby soft skin. But What About Actual Pole Dancing Gloves? 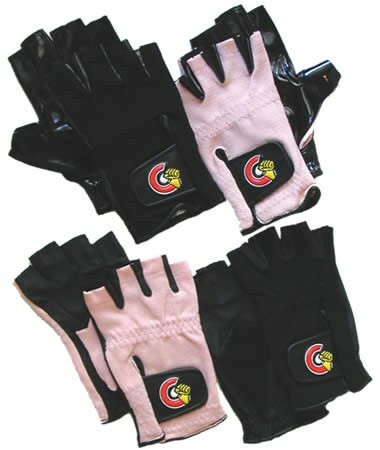 There are also gloves available that are marketed in both "tack" and "no-tack" variations. The "tack" gloves (top photo) have a type of shiny plastic material on the palm and inside of the fingers, which helps you stick to the pole. The "no-tack" type (bottom) have a soft leather, which doesn't grip the pole but is meant to save you from blisters. Though the tack style has some limited usefulness, Your Pole Pal really doesn't recommend either of these for everyday pole dancing. But in the interest of fairness, Your Pole Pal also asked several advanced students & instructors to try out these pole dance gloves and give their opinion. Wthout exception, not one found them to be particularly useful. "These might be useful if your palms tend to be sweaty and you only want to practice moves that require climbing the pole, but that's about it." This instructor felt that, while the gloves did provide good grip while climbing, they actually hindered her dancing in other ways. They didn't allow her to spin, and even basic moves were a challenge as her grip hand was always "sticky." She also found the gloves made her hands hot, which was quite uncomfortable. The "no-tack" variety received even worse reviews. They didn't help at all with grip while climbing, and actually made spinning more difficult as the palm of the gloves would bunch and twist, even with a very snug fit. The testers had nothing good to say about the no-tack gloves. Instead, they suggested that it's better to build up a bit of callus on the palm. This takes patience at first when hands are soft and tender and blisters form easily. But with patience and perseverance the skin does toughen up. To sum up, all of the reviewers felt that these types of pole dancing gloves were not only unhelpful, but that they would actually make it more difficult to learn and master many tricks. The exception was the tack gloves if you only need help with climbing or hand holds. But because they aren't good for spins and other moves, it's debatable whether it's worth putting them on in the first place. So What Should You Use For Grip? Your Pole Pal suggests that polers who have trouble with their grip use one of the many grip products now available, such as Mighty Grip (pictured below). These products are designed to improve your grip without limiting your ability like pole dancing gloves might. There are a number of different product types available, some that are better for countering sweaty palms (like an antiperspirant for your hands) and some that are designed to offer some "stick factor." To learn more about these options, please visit this page. Are There Any Good Pole Dancing Gloves? There is a type of pole dancing glove that Your Pole Pal does recommend, and this is the gauntlet or arm warmer style mentioned at the top of this page. You can whip up a pair easily enough if you're handy with a sewing machine, but most people will probably prefer to just buy a pair (or two or three) since they're quite inexpensive - especially when you factor in the free shipping for the fishnet style shown above! Be cautious though, as there are similar types of gauntlet gloves and arm warmers that DO cover the palm. These are potentially dangerous, and should not be used for pole dancing where climbs and spins are involved. In the meantime, if forearm pole burn is a problem for you and you're waiting for your new gloves to arrive, try loosening up on your grip just a touch. A grip that's too tight can result in your forearm wrapping around the pole as you spin, and it's this friction that causes the burn in that tender spot...ouch!